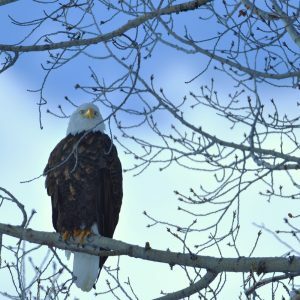 How can I determine a bald eagle’s age? 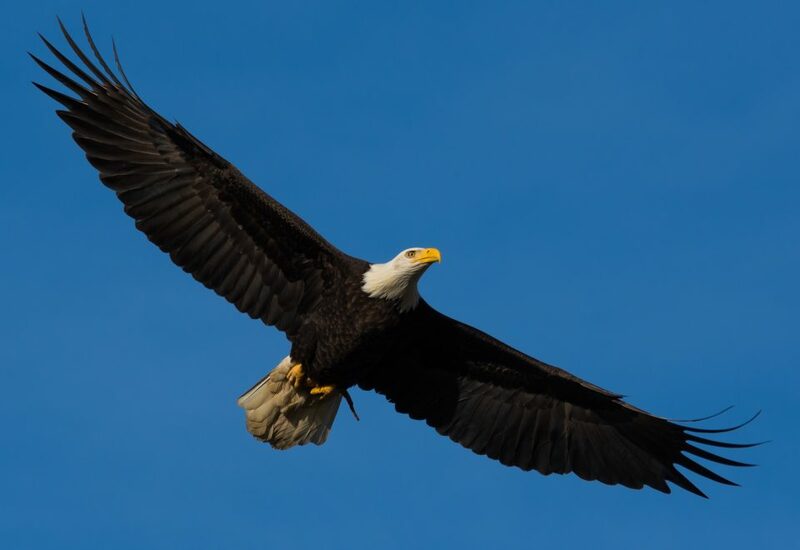 Jackson Hole is home to a wide variety of raptors, including the Bald Eagle, our national symbol. These majestic birds can be seen soaring throughout the skies, enhancing any photo opportunity with a sense of awe. This beautiful creatures are often seen along the Snake River, quietly perched on a large branch studying you as you go by. Just as quickly as you spot one, they are diving into the river with grace and elegance, perfectly snatching that trout and flying off with their prize. If you are lucky, you will catch a glimpse of a juvenile bald eagle and be able to differentiate it from other birds of prey. In fact, we often get asked how to tell what a bald eagle’s age is, especially since they look like many other birds when they are juveniles. In general, it takes about 5 years for them to develop their white “bald” heads. 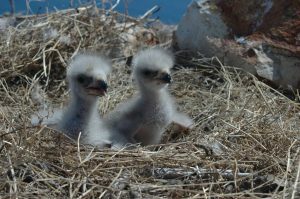 Juvenile bald eagles will have brown heads, a paler brown body and white plumage underneath their wings in the first year of their life. As they approach their second year, their wings will continue to stay white and their body will also become white, although their chest and head will remain dark. In their third year, their wings become darker, their bodies become darker with specs of white and their head gradually turns whiter. 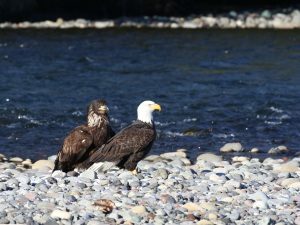 After 5 years, it is challenging to determine how old a bald eagle is by sight. At 5 years old, they become adults and are able to breed, finding lifelong partners and raising their old youth. This entry was posted in Field Notes on June 13, 2017 by gliffen.